Scoring convention exclusive merchandise is one of the best reasons to attend the San Diego Comic-Con. Each year the show floor is literally overflowing with hundreds of different exclusive items. Collectors can buy everything from comic books to toys. Fans wait in line, sometimes for many hours, just to get their hands on this highly prized merchandise. After the convention is over these limited edition collectibles often wind up on ebay for greatly inflated prices. So which exclusives will be the hottest at this year's Comic-Con? Read on and discover the truth for yourself. 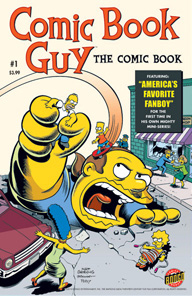 *Autographed copies by Matt Groening accompanied with a numbered certificate of authenticity. 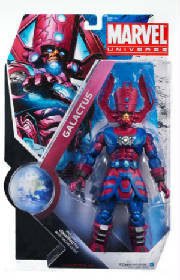 DESCRIPTION: A massive 19" inch figure of everyone's favorite galactic tyrant! The figure features lights and sounds. Packed on a 27" card, this is the largest carded figure ever produced by Hasbro. DESCRIPTION: "On April 1st, Hot Wheels sent a message to our Facebook fans saying that we were going to show them a sneak peek of one of our 2011 New Models. The image that we posted was of Wonder Woman's Invisible Jet. The response to the joke was so positive that the fans asked for us to actually make it for real. 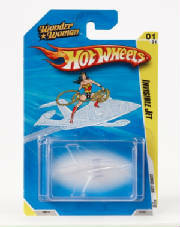 So, just in time for DC Comics' 75th Anniversary, Hot Wheels presents Wonder Woman's Invisible Jet! Get it fast before it disappears!" 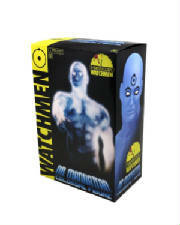 DESCRIPTION: "An exclusive Watchmen Heroclix Dr. Manhattan colossal figure from Wizkids Games and NECA. Figure stands over 14" tall and comes in deluxe packaging. 100 per day, limited to 2 per person." 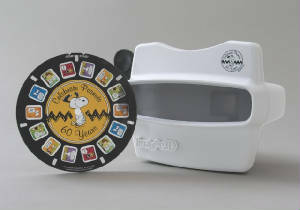 DESCRIPTION: "Kick it old school and celebrate 60 Years of Happiness with PEANUTS 2010 Exclusive, Limited Edition View-Master style viewer! The custom reel features several classic PEANUTS moments in vibrant 3D color. Only 500 have been produced – get yours before they're gone! Only $16 on Preview Night, $20 every day after." 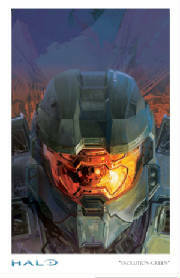 DESCRIPTION: "HALO: Reach "Evolutions" by artist Robogabo Green Variant. Fine Art Giclee on Elegant Velvet Paper, 11 x 17. Developed by Dr. Catherine Halsey, the MJOLNIR Mark VI armor is the final revolution of the spartn-II program. "Evolutions" -Green Variant is one of three fine art limited edition prints that will be released for the upcoming HALO: REACH video game. 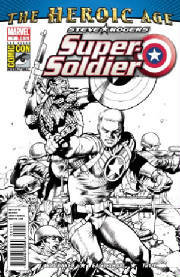 This variant will only be available at Comic-Con." 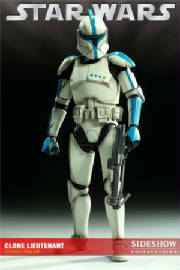 DESCRIPTION: "During the height of the Clone Wars, clone troopers were the backbone of the Republic's new military initiative, with color-coded flashes on their armor denoting rank. From Star Wars: Episode II, the exclusive Clone Lieutenant 12-inch Figure, priced at $89.99, will be available for Pre-Order at Sideshow Collectibles Web Site and can be picked up at the 2010 San Diego Comic-Con in the Sideshow booth!" DESCRIPTION: "Limited Edition of 500. 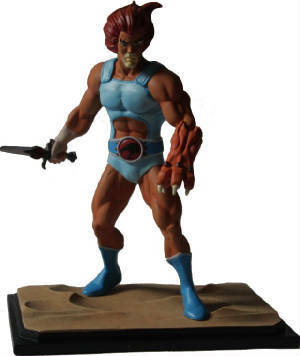 Icon Heroes kicks off their series of Thundercats Mini Statues with none other than Lion-O in battle stance with his Sword of Omens and Claw Glove! This mini statue stands just under 6 inches tall and is incredibly detailed atop an environment base - a perfect display companion piece with other 6 inch action figures and statues!" DESCRIPTION: "Darth Maul returns with a new set of robotic legs! The sith lord is intent on terrorizing the Lars homestead. 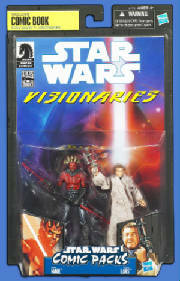 A young Owen Lars (Uncle Owen) is the only person who can save himself and his family from the evil Darth Maul." 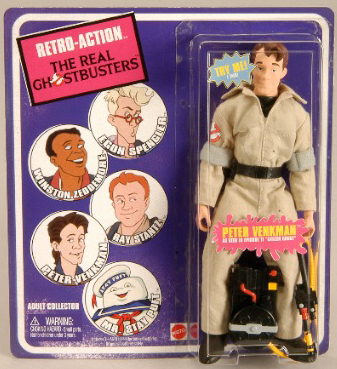 DESCRIPTION: "Retro Action is coming to the Ghostbusters with this "Citizen Ghost" Peter figure from the animated series "The Real Ghostbusters"! Peter talks with 3 phrases right from the show. Also includes proton pack and wand. Special variant for SDCC is an all Ecto Slime version of Peter with clear green skin. This variant is randomly packed and available only at the show! While supplies last." DESCRIPTION: "Sketch variant cover! From multiple award-winning Captain America scribe Ed Brubaker and acclaimed artist Dale Eaglesham comes a mini-series no Cap or Avengers fan will want to miss!" 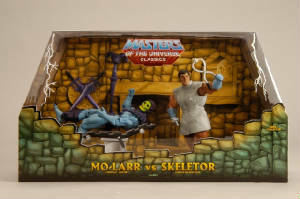 DESCRIPTION: "Straight from Robot Chicken comes Mo-Larr the Eternian Dentist along with his whiniest client Skeletor, complete with missing tooth. Mo-Larr comes with "everything you see here" including drill, floss, and other assorted dentist tools. Window box display to complete your MOTUC collection!" DESCRIPTION: "We'll be offering two new exclusive Voltron Vinyl Figures for Comic-Con attendees to choose from this year. 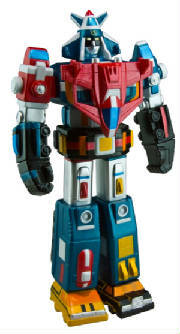 The Metallic-Edition Vehicle Voltron Vinyl Figure is limited to 1,000 pieces and retails for $40." DESCRIPTION: "Rocket World has gone where no man has gone before! The Starfleet I.W.G. 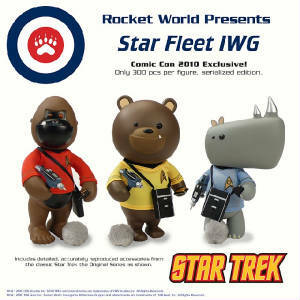 designer vinyl toys come with their very own tricorder, phaser, communicator, and furry tribble. Take advantage of the special con exclusive by purchasing all three at a discounted price!" 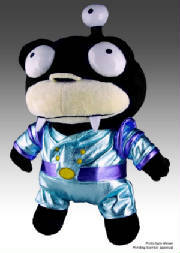 DESCRIPTION: "Futurama: Kicking off our new line of FUTURAMA Collector's Plush is the Comic-Con Exclusive, Nibbler in Shiny Jumpsuit! Limited in production to 500 pieces." DESCRIPTION: "The Hot Wheels version of the Ghostbusters Ecto-1 has been one of the most hotly sought after castings in the 2010 main line at retail. 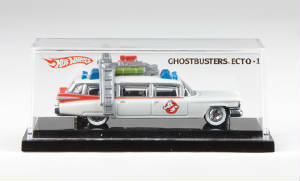 As a result, Hot Wheels decided to create the most detailed 1:64 version of the Ecto-1 to date and sell it at SDCC. Featuring a die-cast body, die-cast chassis, Real Rider tires, and a box that looks like Ghostbusters ghost trap, it'll be sure to sell out fast. While supplies last." 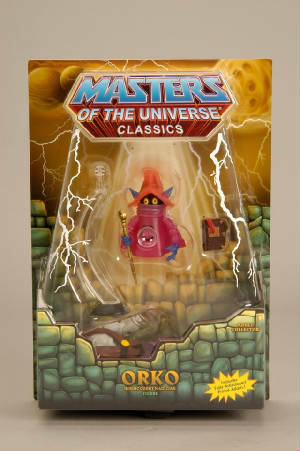 DESCRIPTION: "No MOTUC collection is complete without Orko the magician. Orko comes complete with stand, wand and magic book. And as a bonus accessory, Orko comes with a fully articulated Prince Adam figure who himself comes with an interchangeable head and the full and half purple power. Only at SDCC Orko will feature a magical color change going from colored to clear in hot water!" 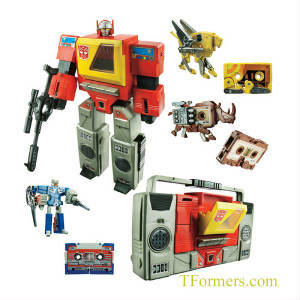 DESCRIPTION: "You may want to look again, because what you thought was just a retro boombox is actually a “ROBOT IN DISGUISE!” Hasbro is excited to offer Comic-Con International attendees its TRANSFORMERS AUTOBOT BLASTER Special Edition figure. Designed in the character’s classic 1984 styling, this special AUTOBOT BLASTER figure includes its three cassette tapes/battle companions: STEELJAW, RAMHORN and EJECT. (Ages: 5 & up; Approximate Retail Price: $49.99; Available through HasbroToyShop.com, Booth # 3329 at San Diego Comic-Con)"
DESCRIPTION: "In celebration of DC Comics' 75th anniversary Mattel has recreated the cover to Brave and the Bold # 28, the first appearance of the Justice League and Starro the Conqueror. Set includes all new 3 ¾" scale figures of Aquaman, Martian Manhunter, Flash, Wonder Woman and Hal Jordan Green Lantern with construct weapon. 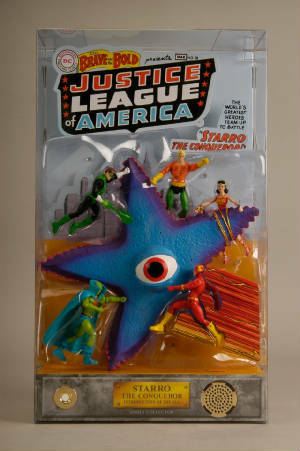 Starro itself is an amazing 8" diameter bendy figure. Box includes lights and sound for the ultimate display! As a bonus, only at SDCC can you receive a polly bagged set of 4 Starro Spores for your 6" scale DCUC figure. While supplies last." DESCRIPTION: "Sgt. Slaughter returns to the G.I. JOE universe at Comic-Con in two different styles! 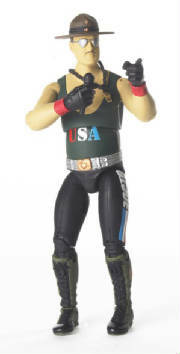 The primary figure is styled with a USA tank top, whistle, non-removable hat, championship belt, baton and a microphone. The variant figure (not pictured, sold separately), in the Triple-T styling, comes with a whistle, non-removable hat, machine gun, and a revolver." DESCRIPTION: "Just like they were when you were a kid, only BIGGER! Gentle Giant is proud to debut their new line of vintage Star Wars Action figure reproductions with the release of this classic Empire Strikes Back Stormtrooper. Digitally scanned from mint 3 ¾" Kenner originals and reproduced to a substantial 12" tall. Nothing has been overlooked. Injection molded and made of durable plastics, this jumbo figure includes a faithfully reproduced blaster and is fully articulated! That's not all, this classic Kenner creation comes packaged on a 1980, Empire Strikes Back inspired blister card with a plastic outer clam shell to help protect and display this limited edition convention exclusive!"